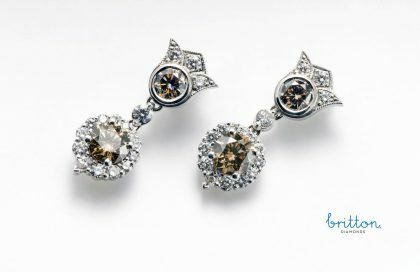 Exquisitely delicious, natural chocolat coloured diamond drop earrings, with a crown of vibrant scintillating diamonds. Chocolate and diamonds the way to a woman’s heart. All center diamonds are GIA or AGS certified. All diamonds are ethically sourced and comply with the Canadian Jewellers Association code of ethics. SKU: 140-00080 Categories: Diamond Earrings, Earrings. Tag: Fancy Champagne Diamond Earrings.